We can’t believe how many people we know who don’t own a pair of rain boots. They just accept soggy socks when they step through puddles, or risk ruining the leather of their favorite knee-highs because they don’t want to wear something ugly, clunky and uncomfortable. There’s a simple solution to this. Get a pair of rain boots we actually like. Yes, it is that easy. We’re here to help. The Griffin Boot by Stuart Weitzman is such a popular rain boot that retailers are having trouble keeping it in stock. That’s why it’s even more amazing that we found them on sale for 67% off! 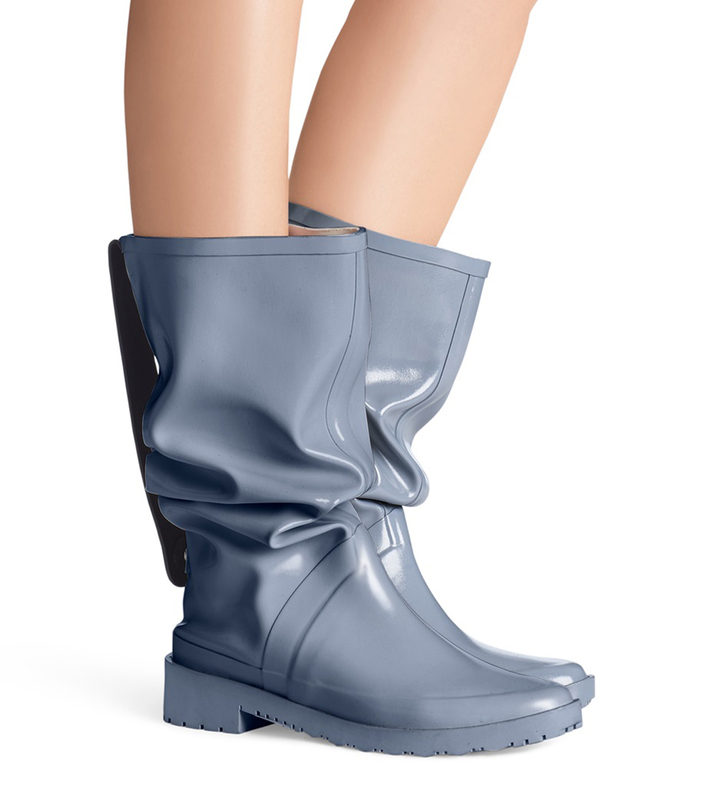 So, what could be so great about a rain boot? Sit back and relax, because we’re about to spill all of the details — while staying dry in our Griffins! See it: Check out the Griffin Boot from Stuart Weitzman (originally $298) for just $99 (67% off while supplies last) straight from Stuart Weitzman! 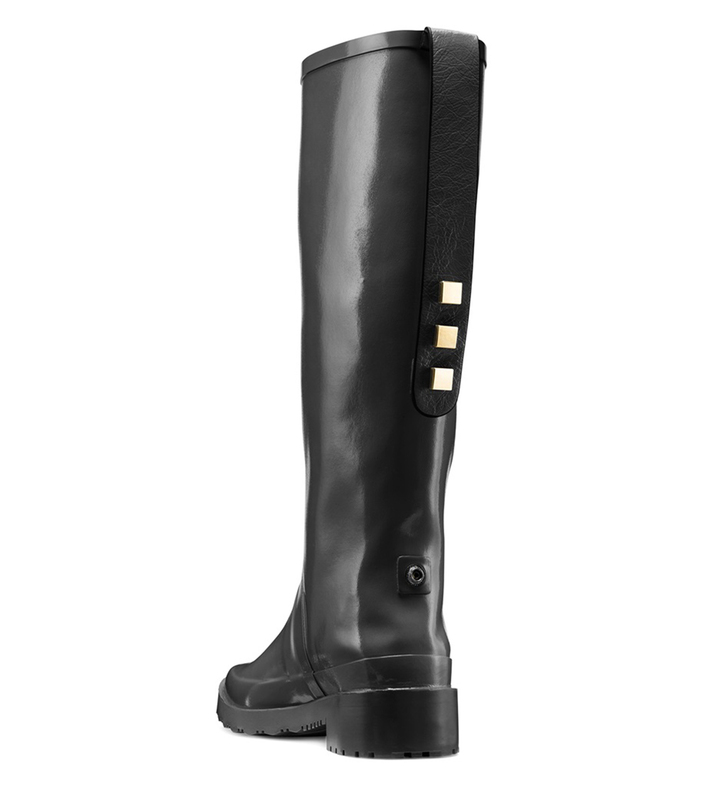 These rain boots are so luxe that it’s easy to mistake their upper as leather. Luckily it’s only a visual factor, and the waterproof rubber keeps us dry from knee to toe. Or mid-calf to toe. What? Yes, we meant that. These rain boots have an adjustable height. Seriously. A crinkled faux-leather strap is attached to the back shaft and adorned with three metal square studs. The strap can be pulled and attached farther down with a snap button to turn this boot into, well, basically a whole new boot. It creates a slouchy look that looks extra modern because of the shine and shapes the rubber forms. We love how Stuart Weitzman took fashion into such high account when crafting these rain boots, since so often designers only care about function when it comes to bad weather. We don’t like to make style sacrifices around here, and we don’t have to. These boots are “equal parts utilitarian and elegant.” On the inside, they have a leather insole so that we don’t have to feel like we’re wearing rain boots even when we are. On the outside, the rubber block heel and rugged sole protect our feet, socks, tights and pants from unavoidable splashing. With these boots on, we may even purposely aim for the puddles, just because we can! These Griffin boots are currently available in two shades, which are both included in the sale! Black is a great choice when we really want to disguise the fact that we’re wearing rain boots. They have a classy look, especially with the gold studs adorning the strap. The sole is also black, not drawing any attention that we’re not already aiming for. Dovetail Blue Gray is the color of the sky after the rain clears up, just as it begins to turn blue again and push away the dark clouds. We really love how the sole of this shade also matches the upper. It’s not too often we see a blue sole like that! It’s totally cool and would help make an outfit. See? We’re even starting to plan outfits around these boots! This blue would look gorgeous with creamy whites or even bright reds. Is blue a neutral? It is now. The lucky shoppers who were able to get their hands on these Griffin boots can’t say enough good things. One commented how they are lightweight, rather than clunky and hard to walk in as we’d typically expect a rain boot to be. We’re not going to let a little rain drag us down! The streamlined silhouette is a big factor in this, and just so happens to look lovely, if we do say so ourselves. Another shopper said how it’s even comfortable to drive in these boots! We’d rather not have to change our shoes every time we step in and out of the car, so this is a major plus. They fit just snug enough against our feet that we also don’t have to worry about them slipping when we’re switching from the gas to the brake. So how are we feeling about rain boots now? Like we may have been missing out with a pair like these, but it’s not too late! April is on its way, and we all know what that means. Plenty of rainy days are to come, so grab an umbrella and get ready to sail the seas that are our sidewalks in style! See it: Check out the Griffin Boot from Stuart Weitzman (originally $298, now 67% off while supplies last) for just $99 straight from Stuart Weitzman! Not your style? Check out other sale boots from Stuart Weitzman we’re obsessing over!